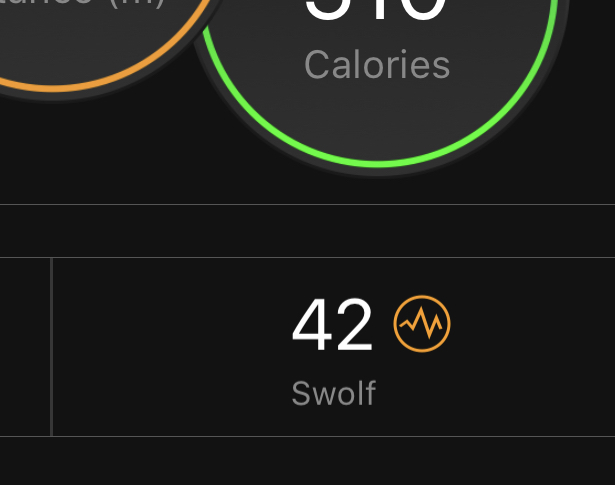 What is Garmin’s SWOLF score is the topic of our blog this week aiming to help explain what the mysterious SWOLF numbers mean on your Garmin watch and how you can use them to track your swim performance. If you have a multi-sport Garmin such as the 920XT or 935XT that you wear for your swimming sessions you may well have read with interest your SWOLF score after a swim session and then dismissed it as something relatively useless with the number meaning nothing to you. Is a big number good or bad? What number should I be aiming for? How is the number calculated? We will try and cover this and provide the answers. Your SWOLF score is the sum of the time for one pool length that assumes a pool size of 25 metres + the number of strokes for that length. For example, 30 seconds plus 15 strokes equals a SWOLF score of 45. For open water swimming, SWOLF is equally calculated over 25 meters. SWOLF is a measurement of swimming efficiency and therefore like golf, a lower score is better. So stop beating yourself up if you keep getting a smaller number! It isn’t a measure of speed alone though so don’t use your SWOLF score along to determine your finishing time in your next race. So what is a good (and equally bad) SWOLF score? The basic idea of SWOLF is that the fewer strokes and less time you take, the more efficient your are in the water. As a result you should use the SWOLF score to track your efficiency in the water which for triathlon is almost as important as your speed. Essentially it helps you track how much juice you will have left after the swim leg before you hit the bike. What you are looking for is a quick time out of the water that you can deliver efficiently enough to still perform well on the bike and run. It isn’t a replacement for a CSS (Critical Swim Speed) pace but is good to help with that efficiency question. Speed = no, efficiency =yes. SWOLF is better than simply counting strokes because you can lower the amount of strokes taken by gliding along in the water. This slows you down, something the SWOLF score will indicate. So no point in gaming the score with a very slow glide through the water as while this is technically efficient you might as well just be doing breast stroke and potter around while having a chat. This will equally leave you exiting the water with plenty of energy but so far behind the pack even a Tour De France paced bike leg is unlikely to help you. An SWOLF score isn’t an exact science as you need to consider we are all different sizes but it is a relatively good indicator to couple with pure time and CSS type inputs on your performance. General consensus across the experts is that a score in the region of 35-45 is good and no need to keep pushing yourself harder than you already are. 2) Maintain the same stroke rate but reduce the time taken. 3) Or most likely achieve an improvement against both with less strokes and less time. Technique and efficiency is something that you can only develop through practice, while strength and overall fitness are enhanced through training. The SWOLF score shows that optimal swimming is a balance between efficiency (stroke length) and power (stroke rate). SWOLF is a pool drill designed to measure efficiency in swimming. It’s been used by some of the best swimmers in the world, including Olympic champions, and some of the sports’ leading coaches. It is worth noting that SWOLF is not particularly meaningful in comparing different swimmers. So where am I in the world of SWOLF scores to give some sense of reality to this? On a good day I push a sub 40 SWOLF score with a more lazy session leaving just the wrong side of 40. Swimming is in reality my strength in the triathlon three disciplines and in most pool sessions I can hold my own. Tee me up next to a proper dedicated swimmer though and I have my arse kicked all over the pool. In most races to date I tend to find myself in the top quarter of the pack so if you are struggling with your swim and you have an SWOLF score in the 50’s a good target may be to try and get your score to around 45 where you will then find yourself competing in the thick of the pack.